May 24, 2016 (Tony Cartalucci - NEO) - Throughout history, controlling India was the key to controlling Nepal. British control over the landlocked nation was an extension of its control over India itself. Today, imperialism is far from a distant memory. It did not go "extinct," rather, it merely "evolved." Today, imperialism looks like national and international "aid programs" which are used as fronts and vectors for corporate special interests. USAID, the World Food Programme, and others, for instance, serve as fronts and vectors for corporations like Monsanto. In turn, Monsanto seeks a monopoly over world food production and the immense wealth and influence associated with such control. Just like the British East Indies Company did for centuries (1600's-1800's) the West is using a combination of corporations and foundations to project geopolitical power. And few other sectors engender such sought-after geopolitical power like control over a nation's agriculture. The story of corporate-financier interests attempting to conquer Nepal through this method is not new. In 2011, when "Maoist" rebels finally took control of the country and Western-style "democracy" foisted upon the Nepali people, Western corporations were already positioned to overrun the levers of power by controlling the nation's infrastructure. In the immediate aftermath of years of fighting, USAID along with Monsanto and a corrupt, weak, and vulnerable Nepal government began a "pilot program" indoctrinating some 20,000 farmers in the use of patented, poisoned, economy-wrecking GMO crops, and in particular Monsanto's infamous hybrid maize breeds. The program had also received backing from members of neighboring India's government who had already helped introduce Monsanto's GMO crops throughout their country -beginning the wholesale destruction of India's food security and domestic farming industry. 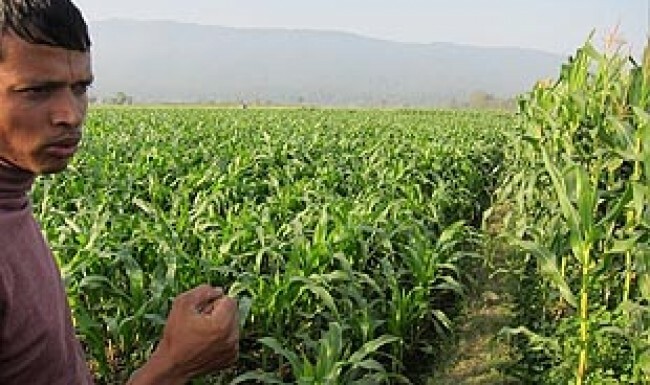 A US-government supported pilot project to introduce into Nepal hybrid maize seeds produced by the multinational, Monsanto, has set off alarm bells over its potential harm. 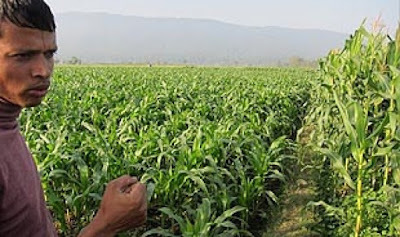 USAID's Nepal Economic, Agriculture, and Trade Activity (NEAT) has got the Department of Agriculture and Monsanto to set up test plots to promote the new seeds in Chitwan, Nawalparasi and Kavre districts. This pilot plan will train 20,000 farmers in hybrid maize production methods and help in marketing the seeds. The USAID-Monsanto partnership is blatant exploitation of a corrupt and unstable government in Nepal. There is no 'point of no return' when it comes to this issue. Monsanto's presence in Nepal will be irreversible and will result in the introduction of genetically-modified crops, further alienating farmers from their land and food production, with disastrous consequences. 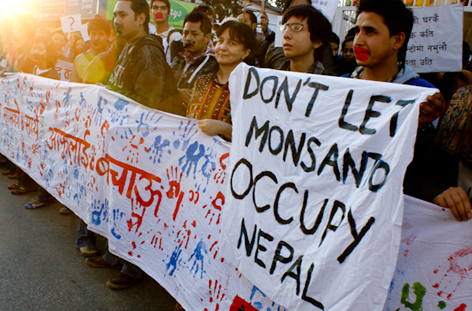 Resistance to this power-grab disguised as "aid" began immediately, but it was only in 2014 that the Nepal government through a court order, finally prohibited GMO seeds from entering the country, thus disrupting Monsanto's plans. After a 2-year battle, Nepal's supreme court issued an order Wednesday temporarily prohibiting the import of genetically modified seeds. This would prevent multinational agricultural corporations like Monsanto from selling and distributing their products in the country. Many in Nepal celebrated the news. However, the battle between genuine activists and NGOs versus corporate-funded operations posing as NGOs continues. The following year, in an effort to improve its image in Nepal, Monsanto would offer a paltry 150,000 USD in "aid" to help "towards relief and rehabilitation efforts in Nepal" after a devastating earthquake struck, its press release would claim. Considering the massive profits Monsanto reaps from neighboring India alone, and the amount of money it spends on lobbying, 150,000 USD is not only insignificant, it is insulting - a true testament of Monsanto's priorities and principles. According to Monsanto's own website, its India office covers Nepal, Bangladesh, and Sri Lanka as well. Without constant vigilance and activism by advocates for food security and food sovereignty in Nepal, the threat Monsanto and other corporations like it, will continuously loom. Just like during the age of British imperialism, the key to controlling Central and South Asia, is controlling India. A strong foothold there - like Monsanto possesses - ensures constant pressure on India's neighbors. With USAID and the World Food Programme openly working with and essentially for a corporation motivated purely by profits, Nepal, and many other nations around the world, both developed and developing, must be vigilant regarding such "charities" and "aid" organizations. They are clearly humanitarian in name only, and instead, serve as vectors for very inhumane agendas. Monsanto Co, the world’s biggest seed company, threatened to pull out of India today if the government imposed a big cut in royalties that local firms pay for its genetically modified (GM) cotton seeds. The royalties are the key to controlling India's food supply, and food supplies everywhere else Monsanto does business. If and when its GMOs take over food production, the world itself will become beholden to it, these royalties sustaining Western hegemony over global food supplies. Monsanto and corporations like it, as well as the centers of power from which they operate - primarily Wall Street, Washington, London, and Brussels - will further advance what they call their "international order," by controlling the international food supply. Control over one's food supply lends a significant amount of influence over what should otherwise be a sovereign government answering to its people, not foreign corporations who can, at any time, create bounty or famine, skew markets or bolster them. Image: Little else could be more despicable than spreading corporatism under the guise of "aid," and especially claiming that is "form the American people," rather than at the expense of both them and the people USAID is "aiding." That the backlash against Monsanto has put enough pressure on the Indian government to make decisions acting against Monsanto's interests is, however, a sign of hope. Not only must pressure continue to be placed both on Monsanto directly and those in local government approached and bought-off by Monsanto, but alternative agricultural models, markets, and infrastructure must be created by both farmers and consumers, for farmers and consumers - cutting out both middle men and foreign corporate interests seeking power and profits at the expense of the people. Nepal's temporary reprieve from Monsanto's advances despite the vulnerability it faced after its protracted civil war, should give hope to others in nations under more favorable conditions. Knowledge both of the geopolitical threat Monsanto represents as well as the more immediate economic and agricultural threat it poses is perhaps the most valuable tool in establishing resistance. To finally defeat Monsanto, however, nations throughout the world will have to develop viable alternatives to feed themselves that are both healthier, and more profitable than the promises offered by Monsanto and other multinationals engaged in agribusiness. 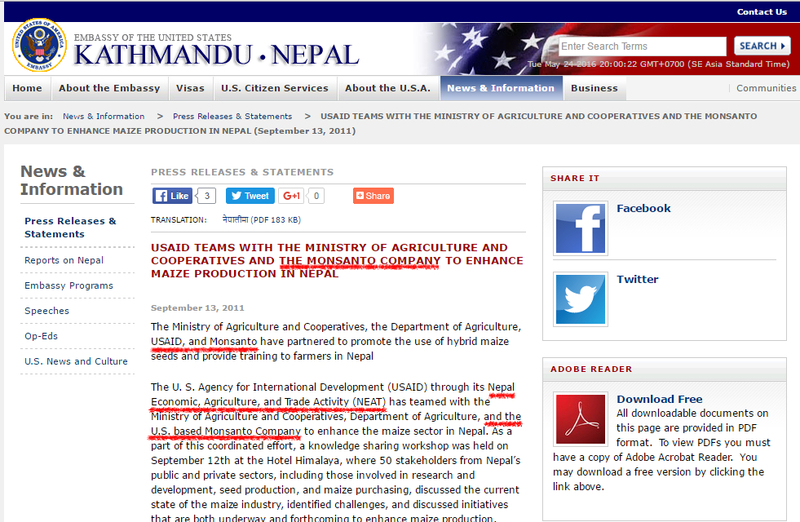 Editor's Note: Further evidence of Monsanto's ties to both USAID and the US State Department can be seen in the US Embassy in Nepal's own September 2011 press release titled, "USAID Teams with the Ministry of Agriculture and Cooperatives and the Monsanto Company to Enhance Maize Production in Nepal." Also featured on USAID's official website is "A Data Picture of USAID Public - Private Partnerships: 2001 - 2014 (.pdf)," which lists Monsanto among other notorious corporations as "Most Frequently Participating in USAID Public-Private Partnerships."